Our Hydralada Elevating Work Platforms include a range of all-terrain machines that ensure safe and efficient operation with minimal running costs. These all terrain machines for sale are available in a range of models lift heights to suit a variety of applications. 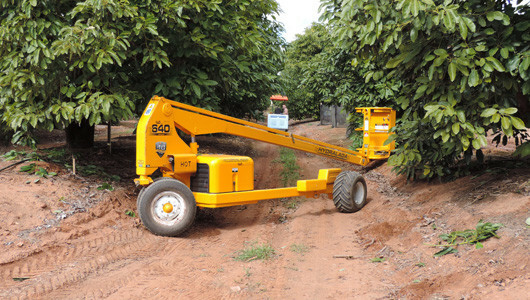 Hydralada Elevating Work Platforms for orchards enable the operator to move safely & efficiently from one position to another on rough terrain while elevated. The reason so many people choose Hydralada orchard cherry pickers is their proven reliability combined with minimal running costs. These economical machines provide easy operation for most pip and stone fruit orchards with low-hanging branches and narrow spacing among trees and other vegetation. The 3 metre floor lift height of this sleek, low tailed model can move around without the risk of damaging branches or fruits. The 360 Hi Lift Model is the ideal pruning and picking platform for orchards. Having a cage lift height of 3.6 metres, the usage of this machine goes beyond harvesting and pruning medium sized trees to servicing netting structures and centre pivot irrigation systems. Known for being the favourite choice for avocado and mango orchards and in the industrial sector, the Maxi Models boast a platform height with a range of 4.4 to 8 metres. These machines are ideal for working in the most difficult and uneven terrain. The Maxi Models deliver stability, traction, optimal reach and excellent performance. Built as the perfect companion for the smaller machines, the 640h is the workhorse of the range. Popular with taller crops and industrial builders this machine delivers excellent stability when working in the most difficult terrain.